Yesterday, acclaimed American electronic musician Porter Robinson released an anime. 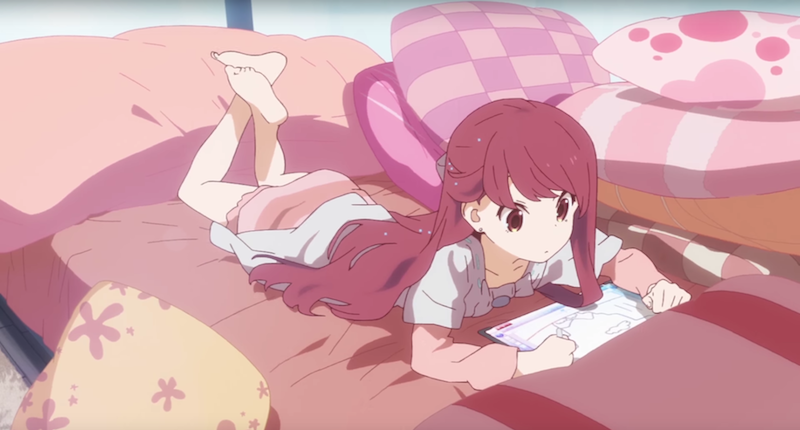 Shelter is the short and tender story of a girl living alone in virtual reality, rendered by Japanese animation studio A-1 Pictures. Over the last 24 hours, it has received overwhelming praise. And, after its swift removal from Reddit’s 420,000-strong anime subreddit, Shelter has also become the latest peg in the debate over what actually defines “anime”— a debate that has apparently resulted in death threats to /r/anime moderators. Robinson, 24, is from North Carolina and, in 2016, was named MTVu artist of the year. Shelter’s co-producer, Madeon, is from France. Next month, the duo will be performing at New York’s Madison Square Garden. Since Robinson’s 2010 debut, he’s become somewhat of a sensation, particularly among American otaku. Robinson draws heavily from J-pop, sampling vocaloid-inspired female sounds in his dreamy electronic tracks. In an interview with Popspoken, Robinson told reporter Skii Chung that his brother, now a video producer at Polygon, got him into video games and anime at a young age. Dance Dance Revolution’s bubble-gummy music was a big influence for him. Robinson and Madeon spent much of 2016 producing, writing and making music for Shelter, a stunning anime-inspired music video for their eponymous single, which Rolling Stone described as “silky electro-pop.” In it, a pink-haired girl with wide, pink eyes navigates a virtual reality that her father made for her. She’s alone in the simulation, but can download her every thought into it and make them real with her tablet: structures, sounds, landscapes, objects. It’s a delicate, precious music video that, by the end, will make whimper like you’ve chopped a truckload of onions. Of course, Robinson and Madeon didn’t make Shelter by themselves—a team of Japanese artists and animators at A-1 Pictures, which produced hit anime Sword Art Online and Magi: The Labyrinth of Magic, designed Shelter. One of the biggest anime studios, Aniplex, claims A-1 Pictures as a subsidiary. None of this impressed the moderators of /r/anime. After the video’s 2 p.m. EST release on YouTube and anime streaming service Crunchyroll, Redditor Abel Toy posted it to /r/anime. It was immediately upvoted to the top at a rate of 98%. Then, it was gone. “Anime,” they assert, is not a “style” of illustration or animation. Reached by e-mail, Robinson was in back-to-back meetings in Japan and unavailable for comment. When Robinson found out about Shelter’s deletion from one of the largest anime forums on the net, he posted on Twitter that he was “heartbroken.” Fans of his, alongside /r/anime subscribers and lurkers, were furious. The post had received hundreds of comments of praise. Shelter had moved several thousand people. It sure looked like anime: big eyes, colorful hair, small mouths. And, yeah, it was produced in Japan. What was the issue? “This is a music video by an artist that contracted out a studio that happens to also produce anime. If A-1 was contracted to produce episode of Spongebob, we wouldn’t allow that either,” a /r/anime moderator explained. Robinson and Madeon produced Shelter. But Shelter’s Art Director, Yusuke Takeda, was also the Art Director for three Berserk movies, several Ghost in the Shell movies, Sword Art Online I and II and Gankutsuou, which is a beyond-stunning anime with ground-breaking art. Megumi Kouno, a key animator for Idolm@aster and freelancer with A-1 Pictures, directed the character design drawing. Storyboard Animation Director Toshifumi Akai was the Chief Animation Director on Magi: The Labyrinth of Magic. The list goes on. Also, Shelter debuted in Shibuya, Tokyo to a live audience on a digital billboard. A-1 Pictures President Tomonori Ochikoshi even told Crunchyroll that “Porter is extremely knowledgeable about Japanese animation and he inspired us with his expectations for what he could create with us.” Robinson and his fans couldn’t understand what about Shelter or its coming-to-be made it less anime than, say, a Studio Ghibli film. When I asked Miyazaki International College anthropologist Debra Occhi, who is based in Japan, whether she thought Shelter is anime, curious, she posed the question to her six anthropology seminar students. Four of six said Shelter is anime because, in her words, “The Japanese style of drawing and language did matter, more than ethnicity of creators . . . and yet it was important that most of them were Japanese,” adding that “The song being by a non-Japanese doesn’t matter.” Two said that, because the production staff was not all Japanese, it’s not an anime. Occhi argues that Shelter is an anime, since it has the “Japanese visual sense and narrative style” along with a production staff stacked with Japanese natives. Shelter’s floaty hair, wide eyes and dotted noses, as well as its roots in Japan, make its status as anime a no-brainer. Despite its look, Shelter’s branding isn’t all-Japanese: Robinson and Madeon boast American and French brands. Shelter is marketed, in part, to those audiences, even though it debuted in Tokyo. Ashcraft adds that some “anime” studios, like Studio Ghibli, steer clear of the word “anime” in favor of “film” or “work,” since the term is so charged. Their branding is distinct. “Anime,” Ashcraft says, now refers more generally to a style of animation—a style that Shelter doubtlessly adheres to—even in Japanese. “Japan doesn’t have a monopoly on giant animated eyes,” Ashcraft says. He maintains that the /r/anime moderators weren’t judging Shelter to be bad. “Anime” isn’t a marker of quality. It’s just a matter of defining a genre—one that Shelter, with its international branding, doesn’t fit in. “We were simply saying ‘This belongs elsewhere,’ like if you posted about classical music in /r/gaming,” he added. You can read his full comment to Kotaku here. Neito still maintains that he and his fellow moderators were right to remove the post. But just one hour afterward, the post was reinstated. Their hands were, in a sense, forced. Angry fans leaked the name of the moderator who had deleted the post. Harassment escalated. Rabid /r/anime subscribers allegedly sent death threats to the mods, which apparently inspired them to contact Twitter support. (These tweets, Neito says, have “since been reported or removed.”) Despite the mods’ firm belief that Shelter is not anime, they calculated that safety was more important than principles. Today, Shelter remains at the top of /r/anime with 5,100 upvotes. Fans have been translating portions of it from Japanese to English and discussing Shelter’s themes of virtual reality and fatherhood. Yesterday, the top comments were quips against the moderators’ unilateral decision about what anime is. Today, the top comments are about how Shelter made them cry.